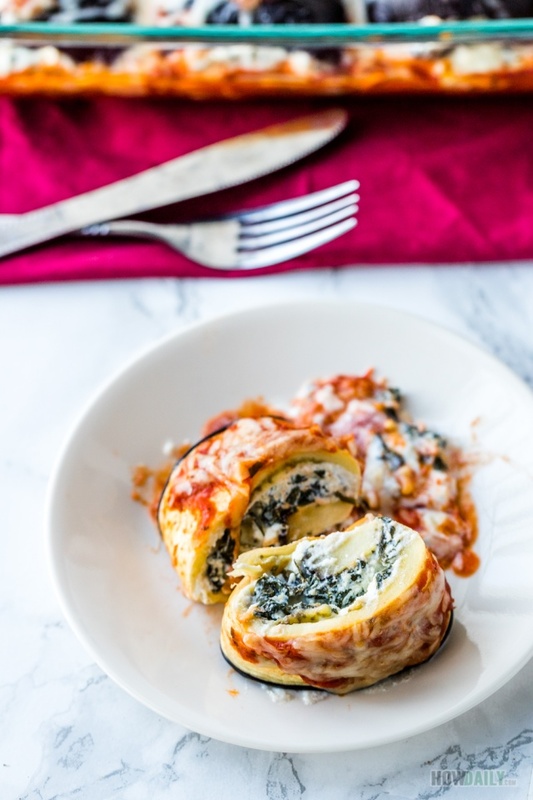 Want some Italian tonight? 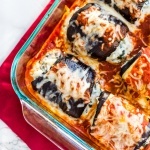 Try this Eggplant rollatini with marinara sauce and extra cheese sprinkle. Calorie watcher? Don’t worry, this is the skinny version that skip all the flour and bread crumbs. 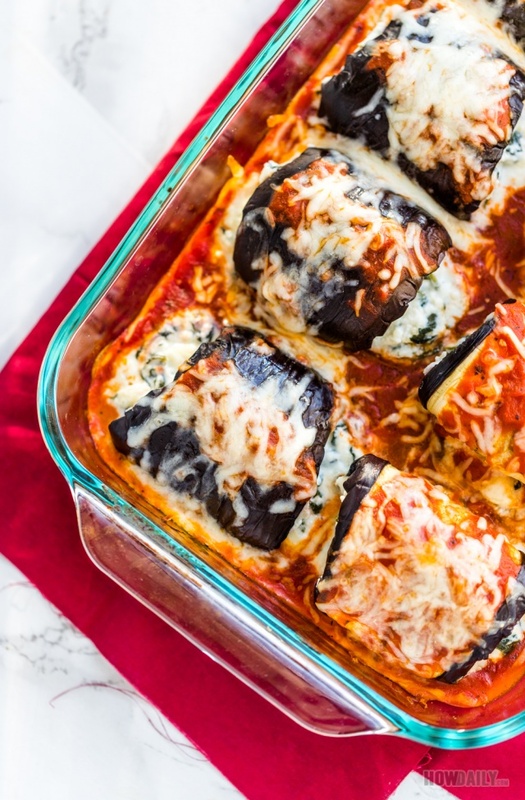 Nice thing about this eggplant recipe is that it will bring up full dose of vegetable needed, like salad but taste truly appealing. I tried to sneak in spinach, garlic, eggplants, etc. things that you always need to consume. You can use either fresh or frozen spinach, just make sure to saute the fresh one with some garlic and olive oil to enhance its scent. Marinara sauce can be store bought to save time, or you can make your own marinara sauce. If you do this, make them a bit chunky to serve as top garnishment as well. 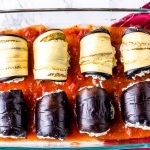 For the main ingredient which is eggplant, you can buy any times, though those with some length are easier to roll. Use a mandoline for even slicing. Skin should be intact cause after pre-baking (to make them pliable), the skin will serve as the main holder. Another note is on baking spray. When baking eggplant slices to make them pliable, it is recommend to line some parchment paper or use non stick pan to prevent sticking. Then use the marinara sauce at the very bottom of your baking dish, that way no need for anymore spraying. 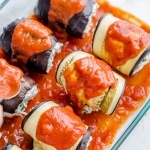 Eggplants rollatini in a guilty-free form for all those who keeping track of their intake but still want the natural goodness. Cheesy, juicy, natural sweetness yet free from all starch, gluten ,etc. 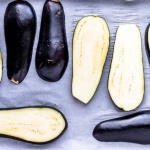 Wash eggplants, cut heads and pat dry and slice evenly along their length into 3-4 slices. 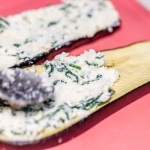 Sprinkle some salt over both surfaces of eggplant slices. Let sit for about 10 minutes then pat dry with paper towels. Preheat oven to 400 F. Prepare a baking sheet/tray, spray or oil it to prevent sticking. Arrange eggplants onto baking sheet, bake for 10 minutes or so till pliable. Let cool down at room temperature. Chop and saute spinach with some olive oil and garlic. Squeeze spinach to remove excess liquid. Add to a large enough container. 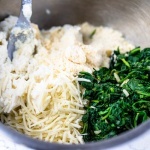 Mix spinach together with all the cheese, leaving 1/2 cup of mozzarella to sprinkle later on. Have baking dish/pan, spread some marinara sauce on its bottom. Lay a slice of eggplant on even surface, then spread some of the cheese/spinach mixture all over its surface. 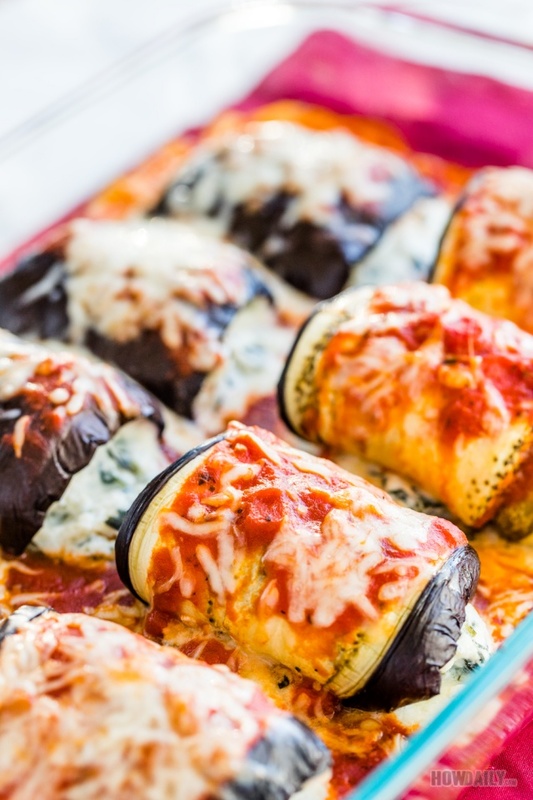 Carefully roll the eggplant slice into roll and arrange onto marinara sauce layer in baking pan. 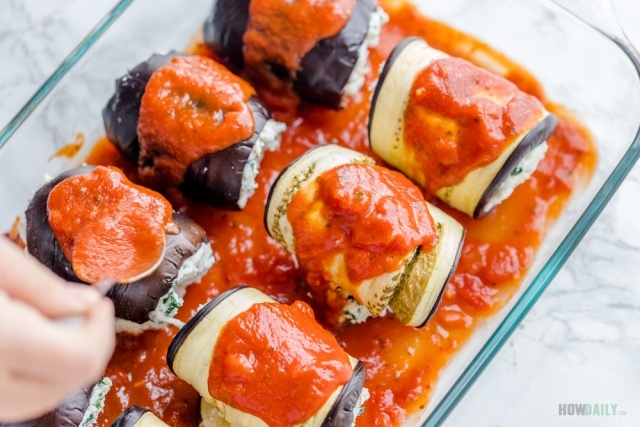 Repeat for the rest of eggplant rolls. Now Sprinkle with the remaining mozzarella cheese and cover pan with foil. Bake for 30 minutes over 350F or until all the cheese is melting.